Hello first graders! I know you’ve been learning about what a scientist is, and I’m thrilled to be able to introduce you to different scientists throughout this school year. Our first scientist is named Terry McGlynn. I hope you will enjoy reading my interview with him, and if you have any questions be sure to leave him a comment! Erin: What type of scientist are you? 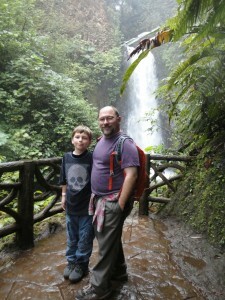 Terry with his son Bruce McGlynn (a fifth grader) in the field this summer. 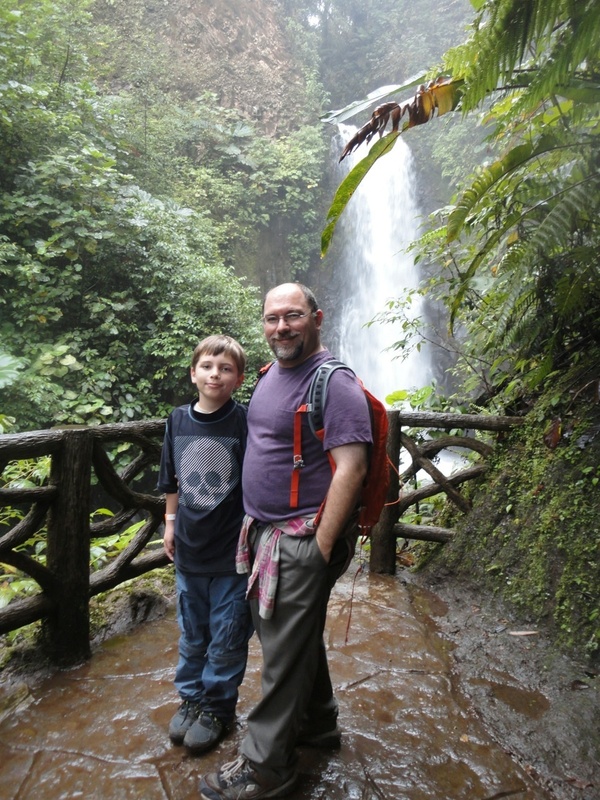 Terry: I’m an ecologist, and I work mostly on ants in tropical rainforests. That means that I am trying to figure out how differences in the environment might affect ants, and also how the ants can cause differences in the environment. Depending on the situation, I might say that I’m a tropical biologist, an entomologist, or a myrmecologist which is a special term for someone who studies ants. Erin: It takes a long time (or at least a lot of school) to become a scientist. What is one of your favorite memories from school, or things that you learned in school? Terry: When I was in elementary school, an education team from NASA visited. This was in the early days of the space shuttle program. They brought a ceramic heat tile like the ones used on the shuttle. A volunteer was brought up on stage to hold the tile from one side, while the educators used a blowtorch to warm the other side of the tile. Terry: Another amazing thing I remember from when I was a kid was the La Brea Tar Pits, which have fossils from the Pleistocene when people coexisted with creatures like giant ground sloths, mastodons, dire wolves and giant jaguars. There is a great exhibit at the tar pits, which is still there, with a whole wall filled with the skulls of dire wolves retrieved from tar pit excavations. They appear all so similar but like all organisms have slight variations. This display in a single glance tells the story of evolution, the history of life, the events that brought wolves to the tar pits, and the importance of museum collections and the people who put them together. Terry: One more memory – when I was in college what I loved most about studying science were the field trips, up to the mountains, out into the desert, and on a research ship in the ocean. I got to learn all about plants, animals and the natural world from people who were so excited about life and were a great inspiration to me. Erin: Where do you work and what do you do on a typical day at work? Terry with students in Costa Rica. Terry: I am a professor at California State University Dominquez Hills, which is in Los Angeles. Every day I spend some time on the computer writing, communicating with students and searching for information. Some days I teach, and some days I also work with elementary and secondary science teachers so that we can all become better scientists and better teachers. I often meet with my students who are doing research to keep up with their progress and advise them, and when I’m really lucky I get to go into the lab and sort through our research samples of ants. It is a little hard to describe a “typical” day! 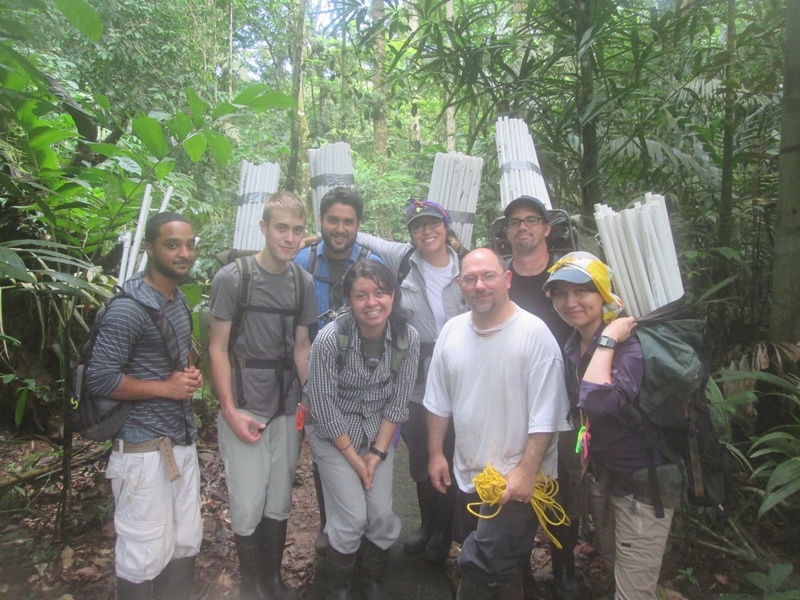 Terry: For about one month per year, I also work in a Costa Rican rainforest with my students from my lab, where we are working long days to run our experiments and collect data and samples to analyze when we get back home. Erin: Why did you decide to become a scientist? Terry: I became a scientist because I was excited about all of the questions that don’t have any answer. I saw that the whole world is an unsolved puzzle, but with no picture on the top of the box. When I was in college, I thought I was going to become a doctor. In my last year of college, I realized that I wanted to be a field biologist instead of a doctor, right in the middle of a medical school interview. Looking back, I have no idea why I even went down that path, especially when I was most excited about classes in evolutionary biology, biogeography, insect biology and conservation biology. Erin: What is your favorite thing about your job? Terry: The people! I’ve been incredibly fortunate to be able to work with so many wonderful students over the years, many who have become good friends of mine. I have been able to bring a lot of students to conduct research in the rainforest, at La Selva Biological Station in Costa Rica. It’s wonderful to see how the experience in a diverse rainforest, combined with immersion in a community of field biologists, can be a transformative experience. The other scientists I work with – both at my university and my collaborators from around the world – are really fun and interesting. I also really enjoy being able to travel to many kinds of places, for research and attending conferences. But I have to admit that some of the most exciting moments have happened when I’ve been working at the computer analyzing data. Once in a long while, suddenly while looking at the computer screen I learn a new and surprising fact in need of further explanation. Those thrilling moments often propel my research into new directions and provide me fuel for working long hours on new experiments. Erin: What is something you’ve found about either being a scientist or the subject you study that most people don’t know? Terry: Most people don’t know that all worker ants are females! Erin: What are some of the things you like to do for fun? Terry: Science is fun! While studying ants is my job, I also do it for fun. I enjoy other things too, of course. I love hanging out with my family, spending time outdoors, camping, reading fiction, and I spend plenty of time in museums, including some volunteering. What do you think first graders? Do you have any questions for Terry about ants, the rainforest, or being a scientist? For my adult readers – you can catch Terry on twitter @hormiga. This post, and all others in my Scientist of the Month series were inspired by the tumblr and twitter thread I Am Science. Thanks for asking! These are great questions. Please ask any more that you might have! There are over 10,000 different species of ants in the world. The closer you get to the equator, you find more species of ants, and when you go further away, then you will find fewer species. Ants do live in cold climates, though there are some kinds of ants that you’re less likely to find there and there are fewer species. Where it’s cold, you’re more likely to find ants nesting under rocks that might warm up in the sun, so if you turn over rocks you would have a good chance of finding an ant colony. When it gets very cold, so cold that you don’t even have trees, then it gets very hard to find any ants and they might not be there. I got to visit Iceland a few years ago, and they don’t have any ants there at all! While many ants have their nests in the ground and dig out tunnels to nest inside, there are a whole bunch of species that do not nest this way at all. The ants that I work with in the rainforest nest inside twigs that are already hollow, and just walk around on the surface of the ground. Others will nest in holes in trees. Some ants spend their whole lives underground, and move around by digging through the soil and walking through tiny cracks in the soil. Those big white tubes that we are holding in the picture are there for our experiments! We were carrying them out into the forest to build little structures that we could use to make shade for the ants. We are learning how the different species respond to changes in light and temperature, to understand how things will be changing as the planet continues to warm up. Field biologists often use tubes like that for all kinds of experiments, to build things and also to mark out their sites so that we can find them when we got out into the forest. It makes me happy that you think ants are cool! If you take any animal – or even a plant – and watch it for long enough, you’ll find out all kinds of interesting things and come up with questions that are fun to try to answer.